Moravian Book Shop is the oldest continuously operating book shop in the United States. 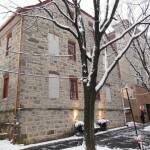 We opened in 1745 and over the years have expanded to occupy 5 different buildings in the Historic District of Downtown Bethlehem. Over the years it seems we’ve attracted quite a few ghosts throughout the buildings as well. One part of the shop seems to be haunted by a mischievous woman in white. When first spotted, the manager thought she was dealing with a shop-lifter as a shady woman ran from one part of the shop into another room. But when the manager asked other staff members where she went, they said they had not seen her at all. Others have, however, when one morning she floated out of the locked door to the basement and disappeared across the room. Many of the basements give the staff bad vibes, or the feeling of being watched. The most common haunt is the one we call our Kitchen Ghost, because he haunts the area around our eatery, the Colony Meadery. Some see shadowing figures, or swear there was a guest waiting in the dining area, only to find they vanish inexplicably. Other times it is the supplies that vanish, but if you ask nicely, the ghost will return them. One night he even helped us out at closing. The staff in the kitchen had shut down hours prior to the manager’s final check, who never looked into the kitchen. She then saw a dark figure in a long black coat run into the kitchen’s back entrance. Thinking she was dealing with an intruder, she got the only other remaining staff member to help her corner the man. But when they got into the kitchen, no one was there. However, a burner on the stove had been left on. We think the Ghost was luring her back to show her the danger and make her turn off the stove! We could go on and on with stories, but we’ll let you visit to find out more!